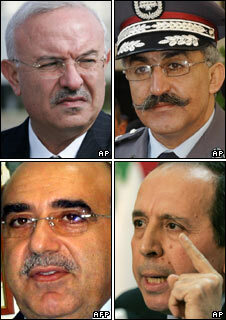 Four Lebanese generals held since 2005 over the killing of former Prime Minister Rafik Hariri have been freed. Their release comes hours after a UN court ruled there was not enough evidence to hold them. Supporters of the generals, mainly from the pro-Syrian Hezbollah movement, fired guns into the air and set off fireworks to celebrate the ruling. 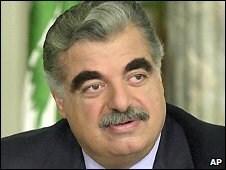 The UN court was set up to investigate the bomb attack which killed Mr Hariri and 22 others in February 2005. The decision to free the generals comes less than two months before a finely-balanced legislative election that pits the pro-Syrian bloc against their pro-Western rivals, including Mr Hariri's own political movement now led by his son. The four men in custody were pro-Syrian generals who all held senior positions in the country's security infrastructure. They were suspected of planning the assassination and carrying out terrorist acts. Belgian pre-trial judge Daniel Fransen ruled that there was not enough evidence to hold them. "The pre-trial judge orders, unless they are held in another case, the release with immediate effect," the judge said. The decision, which was broadcast live on Lebanese television, was greeted with jubilation on the streets of Beirut by supporters of the generals. Naji Bustany, lawyer for Mustafa Hamdan and Raymond Azar, welcomed the decision, but said it should have been taken earlier. "After 44 months, justice has been done. It should have been 43 months ago," he told the AFP news agency. BBC analyst Sebastian Usher says the pro-Syrian opposition led by Hezbollah can use this decision to back up its belief that Syria had nothing to do with Mr Hariri's killing. But it will be a blow to the pro-Western coalition that won the last elections and pointed to the generals' arrest as clear vindication of their accusation that Syria was behind Mr Hariri's assassination, he adds. The UN special tribunal, which started its operations only last month, now has no suspects in detention and the chief prosecutor has yet to name any new ones. But our analyst reports that sources close to the tribunal say it is making substantial progress. Mr Hariri's assassination prompted massive demonstrations, which led to an end of decades of Syrian control over Lebanon - although Syria denied involvement in the killing.